Yes ladies and gentlemen, children of all ages. 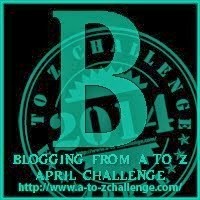 The "B" for the challenge is blogging. As most of the blogs that enter this contest seem to support each other, I want to thank everyone for participating. I have been a part of the challenge for 2 years, this being my 3rd and I enjoy so much. The first year was funny, it seems that was the only time I would keep up with my blog. Then there was last year, when I played around with the settings a little bit, changed the layout and blogged a little more. I have had this blog for several years, and since getting married to someone who doesn't surf the web for interesting reads, I have slacked off on the blogging. In addition, I have had some professional challenges that required my undivided attention for large amounts of time therefore the blog has suffered. However, I have not let the name of Tronster.net die, and I will continue. Here is a list of (5) blogs I keep up with after the challenge last year. By no means is this list complete or in any particular order. The owners are not even aware of me posting links. I am pretty sure this isn't against the rules for the challenge. As you can see from the sign up sheet, there are close to 2000 blogs this year. Maybe I can find a couple of more to read on occasion. Enjoy the challenge and hop around and find something you like. If you like my little peace of the inter-web, comeback often, leave a comment or two, or three maybe even four if you feeling froggy. I hope you DO find other bloggers to follow and read. I've been doing the challenge since its inception. And this year I'm an AZtech minion, stopping by to say HI! This is my second year doing this particular challenge. I enjoy connecting with other's doing the challenge. It is funny to blog for 26 days this month and then the first week of May I will find it challenging to post once a week. Last year I remember feeling like I had nothing left to say,especially outside of my theme.